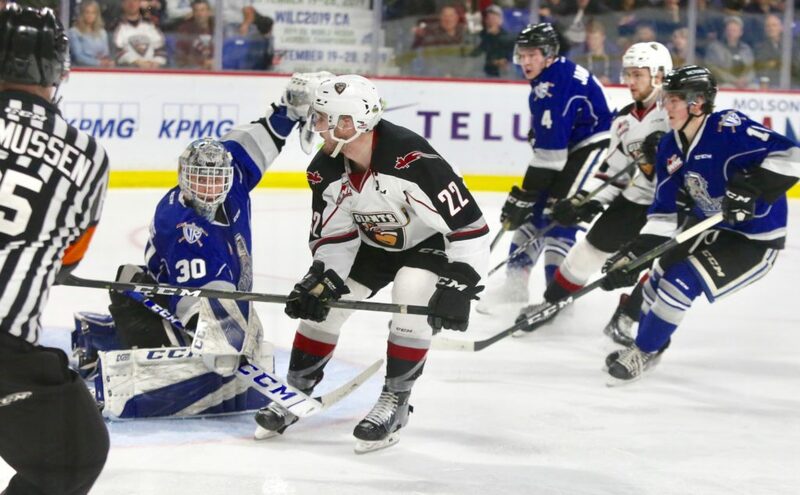 Tonight at the LEC the Vancouver Giants and Victoria Royals will clash in Game 2 of their second-round best-of-seven series. Last night at the LEC the Giants kicked off the series with a 3-0 victory on the strength of goals from Davis Koch, Jared Dmytriw and Dawson Holt along with 15 saves from Trent Miner. The Giants have now won three consecutive playoff games and will look to increase their series lead before the series shifts to the Island on Tuesday and Thursday next week. Griffen Outhouse holds every single meaningful Victoria Royals goaltending record. That’s what happens when you suit up in 196 career regular season games and an additional 27 playoff games with one team over the course of a marvelous WHL career. The product of Likely, B.C. 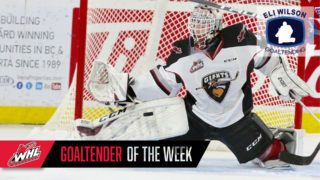 finished his final WHL campaign with a record of 27-16-1-1 and so far in playoffs he’s put forth a solid mark of 4-2-1-0 with one shutout, a 2.69 goals-against-average and a .920 save percentage. Last night Outhouse was sharp turning aside 25 of the 27 shots he faced as the Royals dropped a 3-0 decision to the Giants. 22 of his 114 career regular season victories came against the Vancouver Giants. His career playoff record against the Giants now sits at an even 4-4. Outhouse was never drafted in the WHL Bantam Draft but signed with the Royals as a 16-year-old and joined the team full-time at 17. He’s 12-12-3 lifetime in the WHL playoffs. MILESTONE MARK: With tonight’s Game 2 contest, Royals’ defenceman Ralph Jarratt will tie Tyler Soy for the most playoff games played in franchise history with 45. The native of Fort St. John, BC has acquired nine playoff points (2g-7a) and has played in four consecutive postseason campaigns (2015-2019) with Victoria. Jarratt was selected by the Royals in the second round, 37th overall, at the 2013 WHL Bantam Draft. *Courtesy of the Royals game notes. GAME 2 HISTORY: Since the 2016 WHL playoffs, the Royals have posted a record of 4-2 in Game 2. 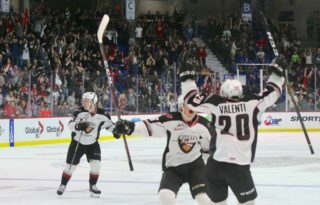 Victoria defeated the Vancouver Giants 5-4 in their Game 2 matchup during the 2018 playoffs. The club has also bested the Everett Silvertips in 2017, as well as the Spokane Chiefs and Kelowna Rockets during their 2016 playoff campaign. Additionally, of those six games; five have been decided by just a single tally, and four have seen the teams combine for seven or more goals. Vancouver Giants captain Jared Dmytriw had a Game 1 to remember. Last night in front of 4500-plus at the LEC, Dmytriw scored once and added an assist as his Giants prevailed 3-0 against the Victoria Royals. The Craven, SK native has now scored in back-to-back playoff games and has two goals and three assists for five points through seven total playoff games. Dmytriw was originally selected by the Victoria Royals in the fourth round of the 2013 WHL Bantam Draft and then went on to play three full seasons in a Royals uniform before being traded to Red Deer in September, 2017. A few months later he was dealt to the Giants and the rest is history. 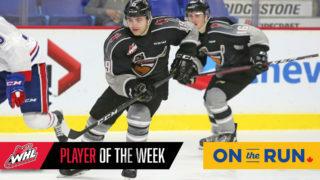 Dmytriw was named captain of the Vancouver Giants prior to the start of the 2018-19 season and posted a new season high of 38 points while matching his previous season high of 15 goals. Dmytriw has suited up in 315 career WHL regular season games and 40 additional playoff games over the course of his career. 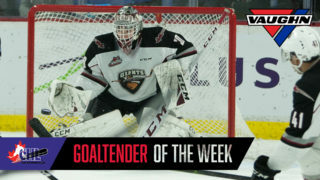 Trent Miner turned aside all 15 shots he faced in last night’s game to secure his first career WHL shutout. The last shutout for a Giant in the playoffs came back in 2009 when Tyson Sexsmith shutout the Spokane Chiefs 1-0 on April 14th in Game 7 at the Pacific Coliseum. The Giants won that game 1-0 thanks to Nick Ross’ overtime goal that came 1:57 into the first overtime period. For the post-season, Miner is 3-1 with a league-leading 1.58 goals-against-average and a .938 save percentage. The Giants are 0-3 in their three most recent Game 2s. Tonight they take aim at their first Game 2 victory since March 24, 2012 when they defeated the Spokane Chiefs 7-3 at the Pacific Coliseum. Each of the past two Giants home playoff games have surpassed 4500 in attendance. The Giants power play has scored at least once in six of their first seven games. The only game where they failed to score on the power play was Game 4 of Round 1 in Seattle.